There’s no place like the Coronation Hall, whether you’re a fan of the theatre, ballet, fabulous live music or just need a place to hold your own parties or events ‘The Coro’ has something for you! The Coronation Hall is one of the major buildings in Ulverston, providing a vibrant hub for the local community. It also has the largest capacity of any hall in the South Cumbria area. Over the years it’s become South Lakeland’s premier and largest arts and events venue, with literally hundreds of different events taking place throughout the year. From coffee mornings to business meetings, concerts to wedding receptions, The ‘Coro’ truly is the perfect all-purpose venue. With The Coro being such a brilliant venue catering for all manner of events–volunteers are always required to help things go smoothly. Volunteers are the life blood of the Coro, so new volunteers are always welcome to help assist the incredible team that currently help out. UCE have a number of volunteer opportunities available from helping behind the bar at The Coro during shows and exhibitions and concerts, to being part of the team at the recently opened Visitor Information Point in the Indoor Market, to working in The Coronation Hall Box Office. There’s plenty of opportunities. The Box Office is, for many, the first point of contact with The Coro, it’s busy, challenging and those who work within it pride themselves on excellent customer care and service and attention to detail. Providing a warm welcome and a positive first impression is a must. Accuracy and having an eye for detail is also an essential part of working in the box office. A high level of data protection has to be provided, and customers need to feel safe in the knowledge that their info will be treated with respect and integrity. If you’re thinking – this is just the thing for me – how do I volunteer?” Please be aware that it would help immensely if you’re computer literate. Training will be given of course – no-one gets thrown in at the deep end, but obviously for this role it’s advantageous to know your way around a computer. You will start by volunteering at quieter times, giving you the chance to get to grips with systems and procedures and dealing with the public – in person, over the phone and via email. A lot of volunteer roles allow for people to volunteer on an ‘as and when’ basis, but volunteering in the box office is different as the role needs a regular commitment, now that could be once a week, or even once a fortnight- as you’ll be dealing with records and information that needs updating on a regular basis. UCE are also looking for volunteers to assist with caretaking duties. There are times when there is a very quick turn round from one type of performance to another – boxing rings come down, as rehearsal space for the next theatre piece goes up. They need people who can move chairs or sometimes decking. And of course they’ll always make sure you do it safely. And then, of course there’s the bar! If you love meeting new people, having a bit of banter and would love to give something back to the community – then working behind the bar at The Coro could be right up your street! Working behind a bar is hard work – you need to be quick on your feet – literally and metaphorically! But it’s also very rewarding. You get the chance to deal with the public and work alongside some pretty awesome fellow volunteers too! The Coronation Hall has two bar areas, one in the main hall (the largest bar area) and upstairs in the balcony bar. Both get very busy, so if you like the idea of volunteering for bar work at The Coro, be prepared for some busy, but enjoyable nights – you certainly won’t be bored! 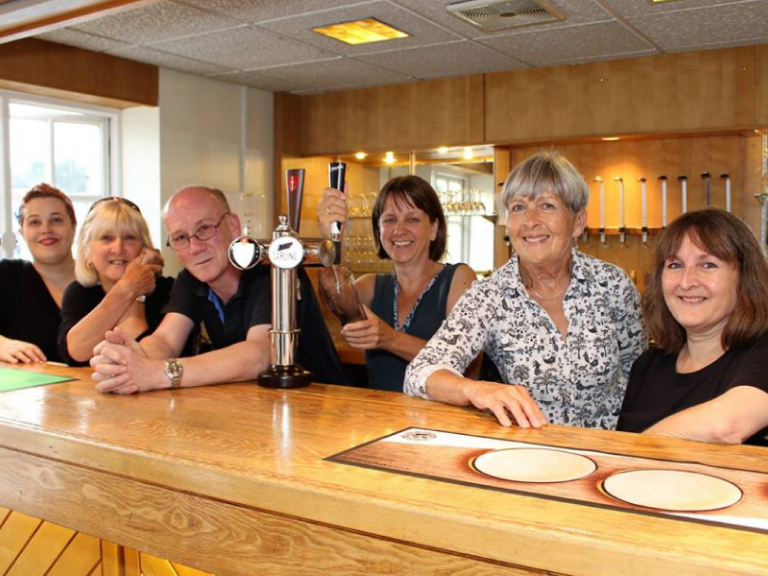 Serving local beers, beer and lager on tap, wines spirits and soft drinks at a wide variety of events and performances means that volunteers for the bar must be over 18, and be flexible as to which bar they work on. Training will be given, so if your bar skills are a little rusty (or non- existent) then don’t worry you’ll be well versed in the art of pint pulling and spirit serving before you become a fully-fledged bar volunteer, and you’ll get the opportunity to learn during quiet times. So do you fancy stepping up and volunteering? It’s fun, a great way of meeting new people, and through your efforts, you’ll be helping UCE to become a vibrant hub for the arts and the wider community.